It is very heartening to read that the new Northern Province Governor Dr Suren Raghavan has called for proposals on channelling the Iranamadu water to Jaffna. He has recognised the long-term needs of the Jaffna peninsula and the need for action now, instead of waiting until the problem becomes an emergency. However, the authorities, particularly those responsible for the North Central Province (NCP) should wake up to the existing water emergency in the NCP. 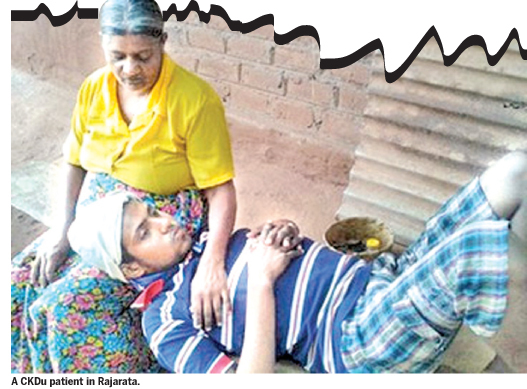 The onset of a form of chronic kidney disease (known as CKDu) was detected by nephrologists in the mid-1990s and has now become a full-blown epidemic among paddy farmers. It is now accepted by the vast majority of Sri Lankan scientists who have investigated the CKDu epidemic that its prevention lies in supplying clean drinking water to the affected areas and not in banning herbicides that paddy farmers use only for a few days in each planting season, and in great dilution. The increasing demographics of the Jaffna peninsula after the eradication of terrorism, demand water both for domestic use as well as for agricultural use. 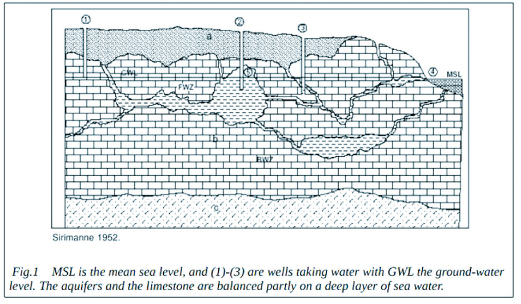 The freshwater supply in Jaffna depends on the existence (via the so-called Herzberg mechanism) of several “lenses” of fresh water supported by an underlying lens of brackish water (See Fig. 1 extracted from Sirimanne’s 1952 Presidential Address to the CAAS). The thickness of a freshwater lens is roughly the thickness of the soil above the mean sea level. Hence, the rising sea (due to global warming) will squeeze out and destroy the freshwater lenses. Consequently, besides the permanent inundation of the Jaffna peninsula, Jaffna will completely lose its water supply unless drastic measures (eg., a dam around the Northern Peninsula) are invoked(https://www.researchgate.net/publication/320258350_A_Tenth_province_or_C... ). An early proposal to supply water was contained in the work of the famous engineer Arumugam who proposed to dam the Vadamarachchi lagoon and the Upparu (Kivul-ara) lagoon as well as the Alimankada (Elephant Pass) lagoon. These lagoons were open to the sea and are saltwater lagoons; but during the northeast monsoon, rainwater from their catchment areas also collects in them. Since a part of this project has been carried out, there are significant questions about the suitability of damming the Elephant Pass lagoon as well. The need to displace existing fishermen from the lagoon area, the large environmental impact, as well as the strong possibility that the lagoon will become a brackish water pond rather than a fresh-water supply are some of the problems envisaged. 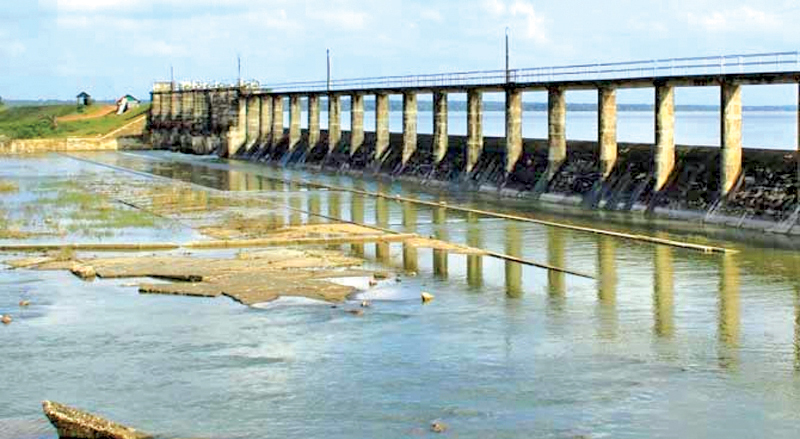 The new proposals to bring water from the Iranamadu (Ranamaduwa) or from an extension of the Mahaweli are the other alternatives. However, it is not just Jaffna that needs fresh water. The CKDu affected areas have had water crises for decades. The accelerated Mahaweli programme settled people in areas on the high ground, somewhat away from the agricultural canals and tanks. Such residents dug ground wells or tube wells, with no testing of the quality of the groundwater. Manthrithilake et al, with the use of isotopic traces, showed that these wells are disconnected from the main water table of the irrigation system. They contain stagnant water that is high in fluorides of geological origin and have a high ionicity (“kivul” or hardness). Although the water was “kivul”, the residents consumed the water and became victims of kidney disease, unlike in earlier times when residents lived closer to tanks and depended on tank cascades and irrigation canals (“Ela”) for their water. Misguided individuals with a political agenda, based on questionable science used the CKDu epidemic to claim that it is caused by the use of the herbicide known as glyphosate. Meanwhile, the majority of scientists accepted the fact that the CKDu is caused by the consumption of hard (“kivul”) or “high-ionic” well water containing fluoride of geological origin. The kidney specialists at the Kandy Hospital and scientists attached to the Peradeniya University have shown this in detail, using laboratory tests on mice, and by tracing molecular pathways in bio-samples and blood obtained from CKDu patients (see,.https://www.researchgate.net/publication/325399594_Transcriptome_analysi... ). However, all this was subverted by ideologues who used the opportunity to gain political capital using the public fear of agrochemicals, a fear especially prevalent among the upper classes who are influenced by Western “green” movements. These are directed against genetically modified organisms (GMO), GMO products such as soya, chickpeas, canola oil and lentils that are in fact imported to Sri Lanka from Canada, for several decades. Be it noted that these products, even when labelled as imported from India, actually originate in North America. The so-called “Toxin-Free Agriculture” movement spearheaded by a misled, Ven. Athuraliye Rathana Thera triggered the banning of glyphosate products in January 2015. Such movements directed the public action away from the urgent need to supply clean water to settlers of the accelerated Mahaweli programme who were given higher-lying lands without the warning that the groundwater is not suitable for drinking. Instead of supplying clean water, the government banned glyphosate by a simple gazette notification and paved the way for a lucrative black market possibly controlled by some politicians. A bogus “ bio-film” product was touted as a safe effective fertilizer and sold with the blessing of the “toxin-free” ideologues (see the article by Dr. Waidyanatha: http://http://island.lk/index.php?page_cat=article-details&page=article-... ). Various concerned individuals have moved into supplying clean water to the NCP settlers. Collection of rainwater (at less than 5 cents per litre with the tank amortised over 20 years as in the picture)and the exorbitantly expensive installation of Reverse-Osmosis plants (at Rs. 1-3 per litre of water) have been undertaken. But these are nothing but stop-gap solutions to the real need of supplying piped water to these residents. Many projects, some based on Japanese aid, had been proposed decades ago. They have been shelved due to political apathy and possibly due to difficulties faced by Sri Lanka’s prevalent “commission culture” in meeting the strict financial standards demanded by the Japanese-aid packages. The proposal to take water from the Iranamadu (Ranamaduwa) to the North should be examined carefully. The traditional solution following the ancestors, or modern irrigation engineers, would be to dig a canal linking the Iranamadu to the North. A more modern, environmentally less impactful approach would be to use large pipes, using modern experience acquired from the oil-pipe technology. Water transported using large pipes (instead of canals) is subjected to minimum evaporation and minimum pollution from animals, people and the surroundings. Installation can be done with the minimum of earth movement if the piping is used instead of digging canals, as earthworks bring up toxic metals in the form of ore sequestrated in the deeper layers of the soil, and also cause high levels of erosion. If pipelines are buried underground, the surface can be closed and erosion is controlled. Pipeline construction and maintenance are also cheaper than for canals. The same technique of using a network of water-pipes should be used even for the NCP villages that are in dire need of clean water, instead of building canals. Let the commendable initiative of the new Northern Province Governor, Dr. Raghavan, be a clarion call to other responsible persons, to act now for the benefit of the long-neglected villagers of the NCP who are at risk from chronic kidney disease. 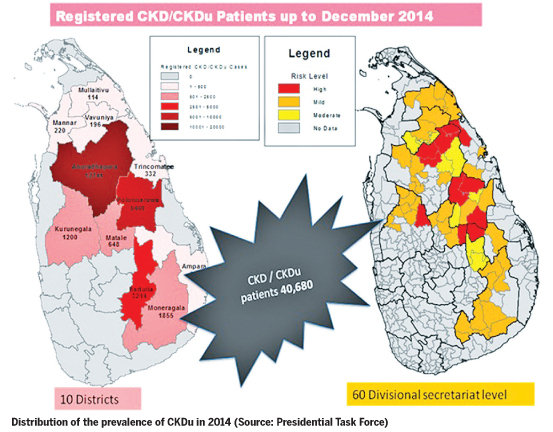 If one were to take a good look the maps in this article, it would reveal to them the real cause of CKDu. CKDu is only where Hill Country water is used for rice cultivation. As shown in the maps, CKDu is there in wider North Central Province, parts of Northwestern (Kurunegala…), Central province (Minipe, Girandurukotte, and Hettipola, and in Uva province (Mahiyanganaya). All these places are supplied with Hill Country water from Mahaweli. First outlet is in Polgolla which takes water to Bowathanne about 50 km northbound from Polgolla. There are no CKDu patients up to Bowathanne. Rice is cultivated with either with rain or mountain water. But beyond Bowathanne all the way to Anuradhapura and beyond CKDu is highly prevalent. Second and the third outlets start after the power plant in Rantambe. Minipe canal supplies water to the left bank of Mahaweli and Loggal Oya canal supplies to parts of Mahiyanganaya, Girandurukotte and beyond. On both sides of Mahaweli about 90 km to Polonnaruwa CKDu is highly prevalent. MOH/WHO study identified about 25 percent to be CKDu in these areas. However in Rantembe itself or to the South of it, there is no CKDu. CKDu is there wherever Mahaweli water is used for rice cultivation. In the southeastern places such as Wellwaya, Monaragala, Tissamaharamya… the relevant rivers from Hill Country are Walawe ganga, Kirindhi oya, Manika ganga, Malala oya… Those waters come from the southern and eastern Hill Country mountain terrains. CKDu is there only where Hill Country water is used for rice cultivation. If fluoride plays a part it must come from Hill Country because fertilizer has 1000 times more fluoride than cadmium according to Dr Dharmawardana in Environmental Geochemistry and Health 2018. CKDu is a proteinuric condition. That means there is protein (albumin) in urine. There is no basis for fluoride to cause protein in urine. There is no theoretical mechanism for that. There isn’t a single publication to show that with credible science. The cause of CKDu is the use of rice cultivation water for rice cultivation. Cadmium and lead are the agents identified by the WHO, US and EU. There is sufficient amounts to account for CKDu in our rice produced in these areas! This is feasible if there is a proper plan without political bias, technically there is sufficient rainfall that goes unused to be harvested properly to meet the needs of all the people in these two provinces and still there will be more water left. What is needed is to come up with a national plan using the present facilities and building on them, as necessary homegrown technical personnel are available; it would to keep the cost of projects down not be necessary to bring experts from overseas to provide clean fresh water to the people.